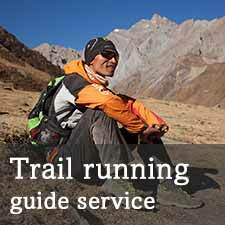 So far...Thanks to: Trail Running Nepal, Lizzy Hawker, Anon., Lloyd Belcher, Neil Cottam, Matt Ingram, Karen Carrington, Isobel Tanaka, Tanja Cesh, Katherine Plichta, Naomi O'Keeffee, Robyn Lui, JFB, Joop Terwiel & Nellie vd Wal, Arpita Maitra, Ranu Harrison, Jessica Frei, Anna Frost, Elodie Lafay, Fred Lentz, Wouter Hamelinck, Emmanuel Abadie, JGH, Cambridge International Ltd., sherpaoutdoor.com, Les Chevaliers du Vent, Bruno Poirier, Didier Nicolas, SPARACINO FAUSTO, Noah Brautigam, Claire Price, Alexander Howard, Michael Ormiston, Nicholas Marett, Christophe Bruyas, Jo Chaffer, Javier Avila, Chiaki Fjelddahl, Lok Jansen, Isobel Tanaka, Sylvie Paquette, Sagun of SEN Nepal, David Ingham, Michael Thwaites, Peter Stalder, Shaun, for donating a total of ~US&dollar;4,938. Calling on friends to help Upendra and Phudorjee to get to race in Europe. Today at a rooftop cafe in Thamel where we were badly overcharged for three cokes. 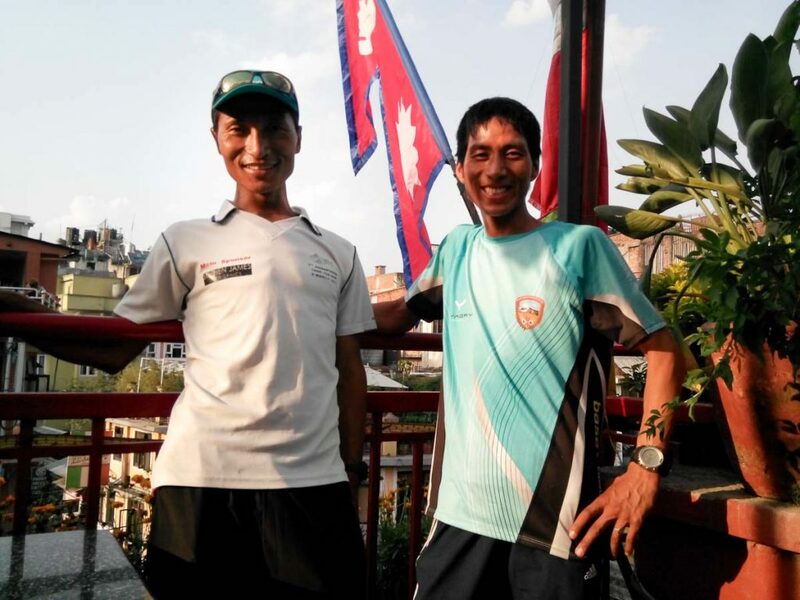 Phu paid though so it is ok.
Two great guys, and great runners from Nepal, Upendra and Phudorjee, and looking to go to Europe this summer to compete in some big races. Both guys are specialists in long, hard high altitude multi-stage races, and do pretty well on single stage races too. Both have made a lot of friends thanks to their good humour, big smiles and humble personalities. We’re raising / crowdsourcing funds for these two guys to go to Europe this summer to compete in some big, exciting trail races, because that is what they’d really like to do. Flying to Europe from Nepal is big money relatively speaking. Add insurance, local travel, accommodation, food and so on and it goes beyond the means of these guys. 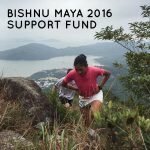 We’re doing a whip around, passing the hat, crowdsourcing to all of their running friends made in Nepal, and other trail runners who’ve come to Nepal to run who may not know them, but appreciate the situation. If you get the idea and you feel like helping these guys have the trip of a lifetime, and to fly that whacky-shaped Nepali flag in the Alps, please donate a few Euros or Dollars with the orange buttons above. We’re trying to raise US$ 4000 to cover this whole escapade. Little amounts from many will surely get us there. Hope you can help with $10 or so. Continuation: Phudorjee has been to Europe before, but Upendra never so this is something new. Phudorjee by the way has a video about him. We’ve just been having a discussion on the roof-top terrace above, and the discussion quickly went to food. No dal bhat in Europe. Phudorjee quickly explains to that some spicy food might be there, Indian restaurants possible, roti (flat bread) etc could be available. Cheese? Pasta? Ice cream? Reminds Upendra of Nepal’s trekking food – meh. Let’s see what real Italian pizza does for him or German sausage. Time will tell. Anyway, they have plans for several races between 40km and 100+ km. 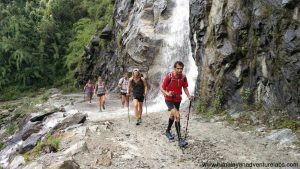 August – Matterhorn Trail Race, Ultracks – Phudorjee (not Jungfrau marathon as mentioned previously). So these two guys are calling on their friends and those they’ve raced with before to raise enough money to cover their flights and transfers at their destinations. 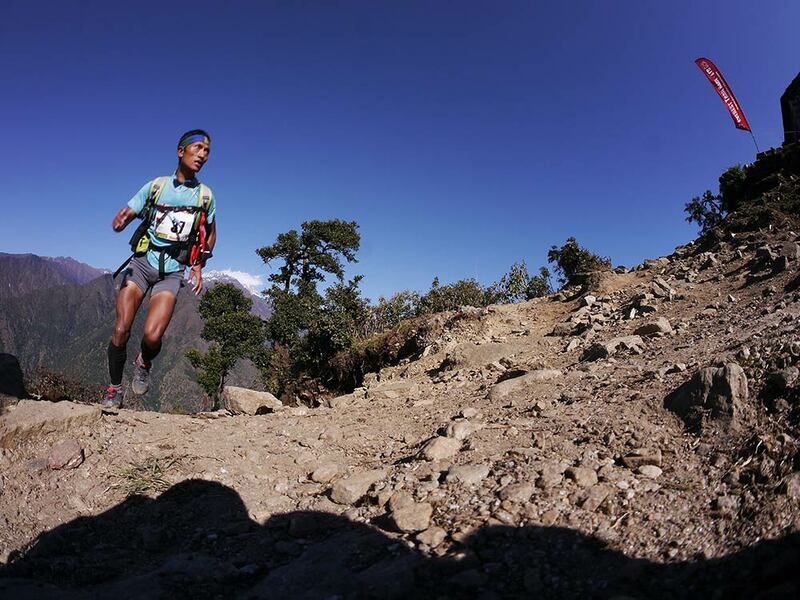 To break up the text – here’s Upendra in the lead in the Everest Trail race last year. 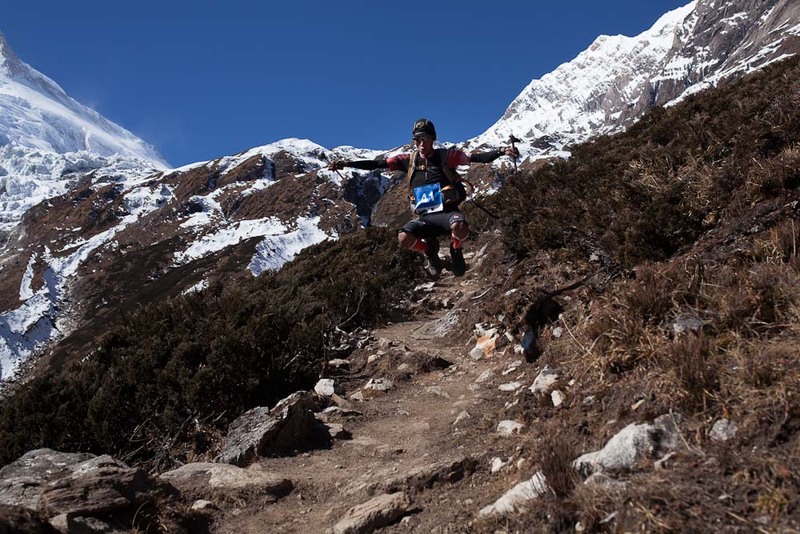 And here is another phutu (photo) of Phu descending, flying at full speed on the Manaslu Trail Race. More text below! Both Phu and Upendra ran together with Andy Wellman from the USA in Mustang this spring. The three ran hard together for eight days at the front of the pack. Andy had this to say on his blog. I can’t really say enough about how impressed I was by these two Nepali gentlemen and how blessed I felt to get to know them and run with them. At this point in my life running in the mountains is quickly taking on the quality of being something sacred to me and as such I cannot think of many ways in which to bond with someone more powerful than enjoying a good long run in the mountains. Not only were these guys always totally gracious competitors, but they are also a ton of fun to be around always laughing and telling jokes. So many times we helped each other to stay on the trail and not go awry. These guys have a ton of experience and many wins between them in these long distance, many day or week long stage races in the Himalaya, and I guess I shouldn’t be surprised, but their ability to stay strong and run fast day after day is astounding. When my energy waned they were basically unfazed. These guys are not sponsored athletes and there are no prize purses to be won in the races that they compete in. They are out there running for the exact same reason as we all are – purely for the love and enjoyment. It inspires them and brings love to their lives. They manage to sustain themselves by working as climbing and trekking guides, but they often take time out during the busy money-earning seasons for these races. I feel very very lucky to have made friends with these two characters and I am also happy that they have the opportunity to run outside their own country like the rest of us. PhuDorjee is planning to the run in the Skyrunning World Championships in Chamonix this June and Upendra if I’m not mistaken is planning to run in Italy this July. Run fast guys! So there you go! Any questions, please email richardpbull@gmail.com and I’ll try to answer your questions. Finally, thanks to Thomas Moser, Tite Togni, Enrico at Trans d’Havet, Cris & Simone at Lavaredo, Diengo at Skyrace, and several more very generous people who provide race entry and accommodation. Ok – golden buttons below. How to donate with credit card. Don’t have PayPal? Look out for the link shown to the right. Thanks for supporting these guys, and giving us the chance to do the same! I added an extra $50 so the boys could have a beer after their races. Priorities! Good luck guys, I hope you both have great success in Europe. Shaun. Total fees =$ US194 PayPal must be delighted! We’ll keep you posted about their progress on the road! Thank you! So far so good – at the airport.